My dentist says I need a root canal? Why do I need root canal therapy? What occurs during endodontic treatment? How many appointments will I need? Will I have discomfort afterward? Should I be careful eating, drinking, etc.? Why was I referred to a specialist? A cracked tooth can produce an array of symptoms, including pain while chewing, sensitivity to temperature or a change in biting pressure. It is also common for pain to come and go, often making it difficult to diagnose the exact cause of your discomfort. When you chew, it can cause movement of the cracked pieces of your tooth, which in turn irritates the pulp within the tooth. At the same time, when biting pressure is released, the crack can close quickly, causing sharp pain. Eventually, the pulp will become damaged and tooth pain will become consistent, even when you are not chewing. Cracks can also lead to infection of the pulp tissue, which can spread to the bone and gum around the problematic tooth. Craze lines: These tiny cracks in the outer enamel of the tooth are common in adults. Craze line cracks are usually superficial and do not require treatment. Fractured Cusp: When a cusp becomes weakened, a fracture may result. The cusp may break off or be removed by a dentist. A fractured cusp rarely damages the pulp, so root canal is not necessary. Your dentist can usually restore the tooth with a full crown. Cracked Tooth: This type of crack extends from the chewing surface of the tooth and vertically migrates towards the root. In some cases, the crack may extend below the gum line, or even further into the root. Damage to the pulp is common. In this case, root canal treatment is usually necessary. A cracked tooth that is not treated will worsen, resulting in the loss of the tooth, so early detection is essential. Split Tooth: A split tooth is usually the result of an untreated cracked tooth. It can be identified by a crack with distinct segments. This type of tooth can never be saved intact. Yet, the position and extent of the problem will dictate whether any portion of the tooth can be saved. Sometimes, endodontic retreatment and restoration by your dentist can be used to save a portion of the tooth. Vertical Root Fracture: A vertical root fracture begins at the root and extends towards the chewing surface of the tooth. Unfortunately, they show minimal symptoms and may go unnoticed. Treatment involves endodontic surgery if a portion of the tooth can be saved by removal of the fractured root. Otherwise the tooth will have to be extracted. If you have a cracked tooth that is causing you pain, Dr. Buurma and his staff can help you understand your options and choose the best solution. 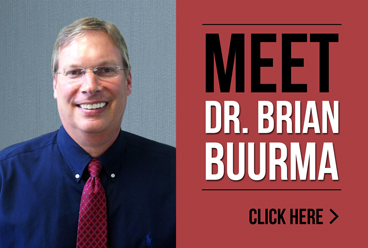 For more information about Brian Buurma DDS or repairing cracked teeth, please contact our office or call us directly at 616.994.9722. Why does my tooth need root canal therapy? What happens during Endodontic procedures? Should I be careful eating and drinking? Copyright © 2019 Brian J. Buurma, DDS. All Rights Reserved.